Pediatric musculoskeletal injuries often manifest differently from adult injuries and similar mechanisms may present differently depending on the degree of skeletal maturity. 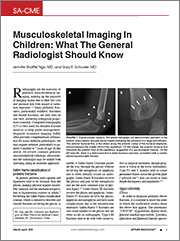 This article outlines many of the common pediatric injuries that the general radiologist may encounter in practice. Select topics include physeal injuries, elbow fractures, developmental dysplasia of the hip, slipped capital femoral epiphysis, and Blount disease. Knowledge of these unique pathologies and anatomic variants will help the radiologist recognize these entities sooner, ultimately helping facilitate the most expeditious and appropriate care. Available for SA-CME Credit. To receive SA–CME credit, you must complete the post exam and review the discussion and references provided with the exam results. 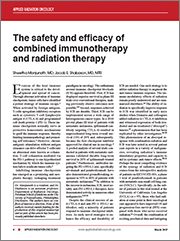 To date, there is little consensus on how to best combine radiation and immune checkpoint blockade (ICB) to maximize therapeutic gains while minimizing the potential for serious overlapping toxicities. This review summarizes relevant clinical data related to both safety and efficacy of the combination of ICB and radiation. 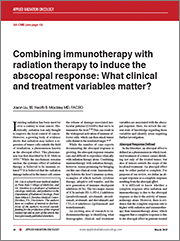 This review article identifies demographic, clinical, and treatment variables associated with the abscopal effect— the phenomenon in which radiation induces a regression of tumor cells outside the field of irradiation. Authors describe the current state of knowledge regarding these variables and examine research on the influence of tumor type, patient’s immune system, overall tumor burden, and radiation therapy parameters on the abscopal effect. Inflammatory bowel disease (IBD), including Crohn’s disease (CD) and ulcerative colitis (UC) is a chronic debilitating inflammatory disease that currently lacks a single gold standard diagnostic test. 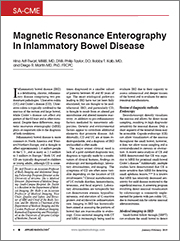 Magnetic resonance enterography (MRE) is an excellent modality for assessing IBD because it demonstrates a greater ability to depict submucosal pathology in comparison to other diagnostic modalities. Although patient preparation for MRE often involves ingestion of various osmotic agents, recent research suggests that this may be unnecessary, as the high level of bowel wall contrast is sufficient even without bowel distention. The ability to distinguish between acute forms of IBD and non-acute forms of IBD is an important role for MRI imaging. Acute flares will demonstrate mural increased T2 signal, best appreciated on fat saturation T2-weighted sequences. MRE also plays a role in the diagnosis of extra-enteric complications of IBD such as perirectal abscess or sclerosing cholangitis. As technological advances in MR, CT, USD, and Combined Angiography/CT systems continue to impact how healthcare is practiced, this Expert Forum Symposium Series, featuring two (2) individual presentations from experts in their respective fields; will highlight through their clinical experiences, how they are maximizing the latest advances in imaging, and assess the growing impact that artificial intelligence is having on improved patient outcomes, satisfaction and throughput. Discuss the clinical value of new deep learning reconstruction techniques in CT. Implement new de-noising methods in neuro MR imaging. With increases in complexity of radiation delivery and patient volume, vulnerable sources for errors may exist within radiation oncology workflow. Patterns of care recommendations are outlined by the American College of Radiology and the National Comprehensive Cancer Network guidelines; however, departmental and institutional policies and standards for quality and patient safety may vary. This article examines initiatives to mitigate errors and enhance safety, and describes efforts to incorporate quality improvement and patient safety into resident education. On the rise, health-related cyberattacks are generally categorized into four groups: data loss, monetary theft, attacks on medical devices and infrastructure attacks. 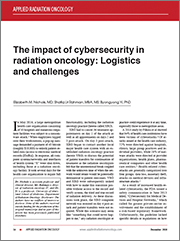 Breaches in cybersecurity can levy drastic consequences in radiation treatment delivery and health care overall. This review article describes experiences and unique needs and strategies pertaining to radiation oncology IT infrastructure, electronic medical records, automatic time outs, treatment planning and delivery, plan verification, screen locking and more to help prevent and overcome a cyber disaster. 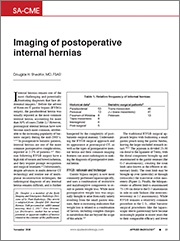 In postoperative bariatric patients, internal hernias are one of the most common, and dreaded postoperative complications; unfortunately, these hernias are also challenging to diagnosis clinically and radiographically. This article highlights several keys to correct diagnosis of the postoperative internal hernia, including understanding the common postoperative anatomy, optimizing CT imaging using oral contrast and multiplanar reformats, and combining findings such as swirling of the mesentery, bowel obstruction and other CT abnormalities to increase the specificity of diagnosis. In the acute-care setting, radiologists should have a high index of suspicion for internal hernias in the setting of prior RYGB surgery and signs of obstruction, particularly given their association with closed loop obstruction and bowel ischemia mandating prompt surgical intervention. 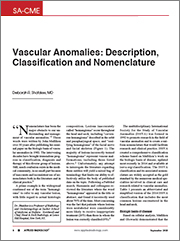 “Nomenclature has been the major obstacle to our understanding and management of vascular anomalies.” These words were written by John Mulliken over 30 years after publishing his seminal paper on the biologic basis of vascular anomalies in 1982. The intervening decades have brought tremendous progress in classification, diagnosis and therapy of this diverse group of lesions. Still, much confusion exists in the medical community, in no small part because of inaccurate and inconsistent use of nomenclature both in the liter-ature and in clinical practice. The multidisciplinary International Society for the Study of Vascular Anomalies (ISSVA) was formed in 1992 to promote research in the field of vascular anomalies and to create a uniform nomenclature that would facilitate research and clinical practice. ISSVA created a comprehensive classi-fication scheme based on Mulliken’s work on the biologic basis of disease, updated most recently in 2014 and available at issva.org/classification. The ISSVA classification and its associated nomenclature are widely accepted as the gold standard by the numerous medical specialties involved in clinical care and research related to vascular anomalies. 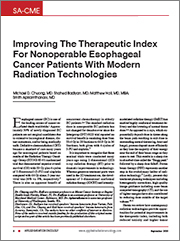 Although there is general awareness that modern radiation technologies both reduce normal organ dose while permitting safe dose escalation in nonoperable EC patients, there is lack of consensus about how these technologies should be routinely employed in the clinic. There clearly is need for well-designed clinical trials to guide clinical decision making in this regard, several of which are being planned (NCT01102088) or already underway (NCT01512589). This course examines how contemporary radiation technologies can improve the therapeutic index, including both reduced cardiopulmonary and hematologic toxicity and higher tumor control, for nonoperable esophageal cancer patients receiving definitive chemoradiation. This review examines the role of trimodality therapy in the management of esophageal cancer, focusing on controversies surrounding the optimal total neoadjuvant RT dose employed. Current and past technologies for radiation treatment delivery and their impact on overall survival and toxicity are discussed. 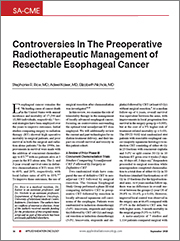 The authors also detail the data driving the management of resectable esophageal carcinoma, reviewing studies comparing neoadjuvant CRT followed by surgery to definitive CRT, neoadjuvant CRT followed by surgery to surgery alone, and controversies in radiation dose and planning considerations for preoperative resectable esophageal cancer. 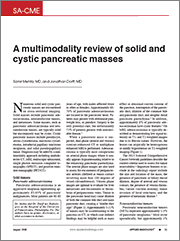 The discovery of incidental asymptomatic pancreatic masses has gone up dramatically with the advent and increasing accessibility of CT and MRI. It is imperative to understand the different imaging features and behaviors of these masses on CT and MRI to construct an appropriate differential diagnosis, as recommendations based on these masses are very different. Knowledge of the relevant clinical history and patient populations affected is also important to formulate an accurate diagnosis. It is also important to recognized pitfalls in diagnosing the masses, as there are both typical and atypical appearances. There are also mimics of pancreatic masses that lead to unnecessary follow-up and workup, for which the radiologist should be aware. 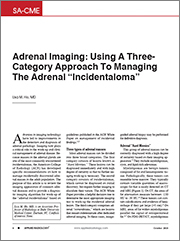 A multimodality approach is frequently needed to narrow the differential diagnosis, though tissue sampling is usually required for a definitive diagnosis. This program describes the Joint Commission’s requirements for annual training on specific MRI safety practices. In addition, it covers procedures to manage patients undergoing MRI with recommendations to prevent ferromagnetic objects from entering the MRI environment; claustrophobia, anxiety, or emotional distress; guidelines to screen patients with medical implants and devices; procedures to prevent thermal injuries; methods to handle patients requiring urgent or emergent medical care; contrast agent safety including information for nephrogenic systemic fibrosis, and techniques to avoid problems related to acoustic noise. Bone tumors are one of the most common lesions encountered by radiologists. 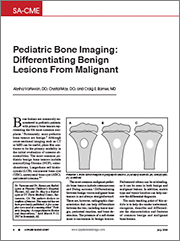 Fortunately, most pediatric bone tumors are benign. Although cross sectional imaging such as CT or MRI can be useful, the most important imaging modality in the initial workup of a bone tumor is the plain radiograph. Differentiating between benign and malignant bone tumors is not always straightforward; however, it is possible to distinguish between them by carefully evaluating charac-teristics such as the lesion’s type of margin, pattern of bone destruction, type of periosteal reaction and presence of an associated soft tissue mass. In addition, matrix type and tumor location can help narrow the differential diagnosis. 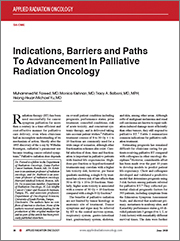 Palliative radiation oncology is an integral part of radiation oncology practice with practical implications in common clinical scenarios including bone metastases, brain metastases, malignant spinal cord and cauda equina compression, tumor related bleeding, fungation, obstruction and visceral metastases. Further education and research is needed as part of residency training and beyond to enhance the spectrum of care for advanced cancer patients delivered by radiation oncologists. Supportive and palliative care skills must expand beyond the technical aspects of radiation therapy delivery to generalist palliative care competencies, including symptom management basics, communication and goals of care, advance care planning, psychosocial issues, cultural considerations, spiritual needs and ethical/legal issues. 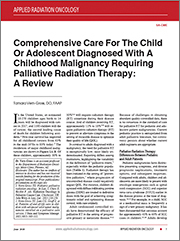 Because of the low incidence of pediatric malignancies, no consensus has been reached on the best practices for the delivery of pediatric palliative radiation therapy. As a result, current practice is extrapolated from adult literature and single institutional series. In addition to the technologies for palliation of pediatric patients are essential components of communication for meeting medical and psychosocial needs of the families and patients; these needs are not always addressed. A multidisciplinary approach with appropriate care and communication addressing patient questions and needs provides meaning and improved quality of life during this phase of treatment. Hydrocephalus is a a mechanical complication of different pathologic conditions and a disease process itself. The morphologic features are easily recognizable, but the patho-physiology remains incompletely understood. Nearly all hydrocephalus is due to cerebrospinal fluid (CSF) obstruction at some point between the ventricles and the systemic venous circulation. Classification is important as it informs optimal treatment. Optimized imaging is vital to the success of flow diversion. Current treatments are limited and invasive: CSF diversion via catheter or endoscopic third ventriculostomy. Decision making relies upon high resolution imaging to determine the site of obstruction and anatomic features that may complicate the procedure. 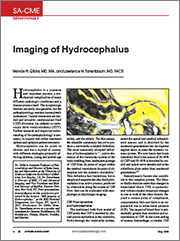 Morphologic and physiologic imaging are used to evaluate suspected normal pressure hydrocephalus (NPH). Several morphologic measures individually and in combination have shown high positive predictive value in identifying individuals who will respond to treatment with ventricular shunting and in differentiating NPH from Alzheimer disease, which can have a similar imaging appearance. 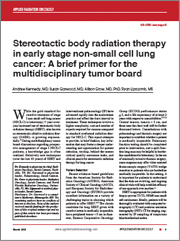 Multidisciplinary team members treating lung cancers may not be aware of the complexity and coordination required for delivery of stereotactic body radiation therapy (SBRT) to lung masses. Shifts in practice have occurred in management of early stage non-small cell lung cancer (NSCLC), particularly with regard to the role of the specialized pulmonologist (interventional pulmonology), which involves different staging techniques than traditional mediastinoscopy. 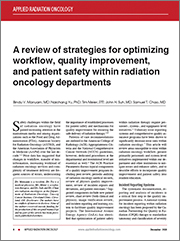 This review provides key information to foster a deeper understanding and appreciation for patient selection, work up, behind-the-scenes critical quality assurance tasks, and clinical pearls for stereotactic radiation therapy for lung cancer. 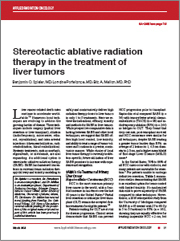 This review article discusses the major indications for stereotactic ablative radiation therapy for liver cancer, as well as the technologies available and/or necessary for safe treatment delivery. Specific areas discussed include hepatocellular carcinoma, intrahepatic cholangiocarcinoma, dose, image guidance and respiratory management, emerging techniques, and radiation-induced liver disease. Given that pulmonary embolism (PE) is the third-leading cause of cardiovascular death and that the signs and symptoms of PE are often nonspecific, many care providers obtain CTA in the acute-care setting to evaluate for any life-threatening or urgent pathology. While most of these patients will likely not have an underlying PE, this article showcases several alternative potential pathologies, ranging from common intrathoracic conditions such as pneumonia, to acute aortic syndrome and intra-abdominal pathology, which may be partially captured via subtle clues on CTA examinations. 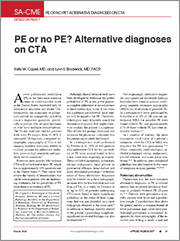 In the acute-care setting, the radiologist’s ability to recognize other potential sources of pain and shortness of breath as well as coexisting pathology in patients being evaluated for PE with CTA is critical. 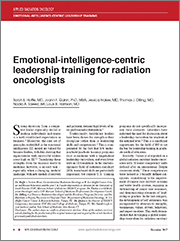 Current residency training in radiation oncology does not incorporate leadership competency skills. Additionally, increasing administrative burdens in healthcare correlate with growing physician burnout and stress, but residency training has no systematic strategy to increase resiliency. Although simulation-based medical education (SBME) can incorporate teamwork, communication, and collaboration exercises at the undergraduate medical level, it has not been studied/incorporated at the national graduate level in radiation oncology. This article addresses the role of an emotional-intelligence (EI)-based leadership curriculum during such training. The range of differences on the augmented/virtual reality AR/VR spectrum are mainly attributed to its depth of immersion. AR/VR technology is being used, through all spectrums of their devices, in surgery, imaging, medical student/resident/fellow education. The utility of AR/VR lies in its advantage to be massively scalable, reproducible, and realistic in simulating clinical environments. 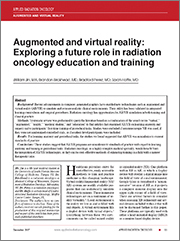 This article discusses how AR/VR technologies can cost-effectively enhance radiation oncology training. 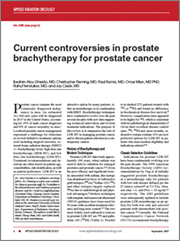 Indications for low dose rate prostate brachytherapy (LDR-BT) monotherapy for high-risk or unfavorable intermediate-risk prostate cancer are currently not based on level I evidence. 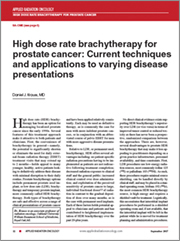 Guidelines discussing brachytherapy indications do not highlight the important RTOG 0232 interim analysis regarding the role of LDR monotherapy and toxicity profile advantage, nor do guidelines highlight the dosimetric value of brachytherapy. This article summarizes the role of LDR-BT in managing prostate cancer and examines patient selection. 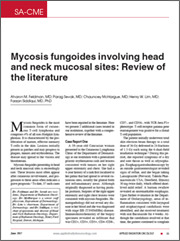 Supported Through An Unrestricted Educational Grant from Bracco Diagnostics, Inc.
Head and neck mycosis fungoides is uncommon, and few publications have been dedicated to this topic. Treatment options vary widely and include several radiation therapy regimens as well as medical management possibilities. Survival and treatment outcomes differ greatly depending on patient co-morbidities, treatment tolerance, and disease progression. This article will aid treatment selection and improve outcome predictions. Much of the data supporting safety and efficacy of definitive radiation therapy (RT) in patients with non-melanomatous skin cancer (NMSC) is older, when its use was more common. Improvements are needed to better represent and categorize high-risk disease. Treatment should be intensified with multimodality therapy for advanced disease. Clinicians must keep abreast of evolving treatment paradigms and novel systemic therapies NMSC. 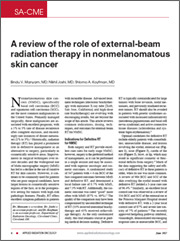 This article reviews indications, dosing, techniques, and outcomes for external-beam RT for NMSC. Prostate MRI can be an effective tool in preventive as well as diagnostic and ongoing patient care for patients with statistical likelihood and/or risk factors predisposing them to the diagnosis of prostatic neoplasia. Used efficiently, MR contributes to early detection, accurate staging and localization, and reduction in unnecessary biopsies and treatment. Skilled reporting provides allied health professionals with critical results to serve patients optimally, allocate resources effectively and improve treatment and surgical outcomes for their patients. This Expert Forum webcast will include a series of case reviews that incorporate and elucidate these concepts. Following Dr. Pomeranz's presentation questions from the audience were addressed in a moderated Q&A session. Identify the clinical indications for effective utilization of MR of the prostate. Be familiar with signal characteristics of prostate neoplasia on MRI, and understand the application of ACR standard PI-RADS scale to this type of imaging pathology. Describe MRI's key role as a diagnostic tool for screening, active surveilance, staging, recurrence, identification, treatment planning and treatment response evaluation. Supported through an unrestricted educational grant from Hitachi Medical Systems.